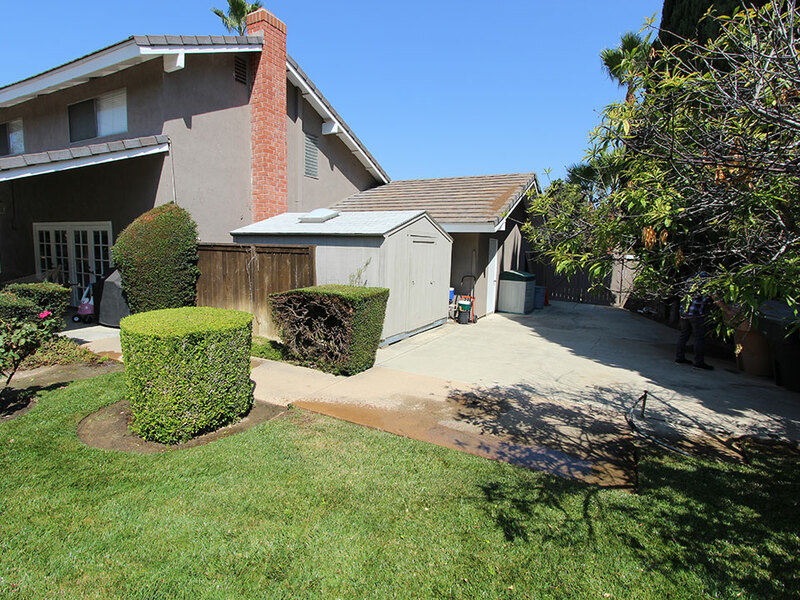 Robin and Tom, the owners of this Villa Park home, came to APlus to achieve two main objectives. 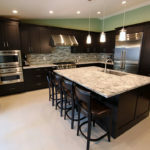 The first was a modernized lower level update while the second included the addition of a new master bedroom and bathroom. 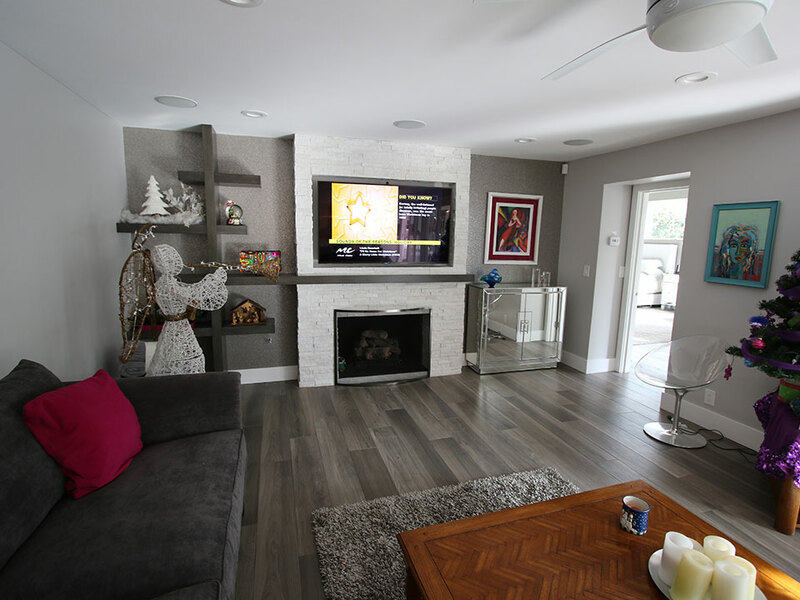 The project represented a massive undertaking over the period of a year, as Alex and the team at APlus worked with Robin and Tom to design the home and master suite they’d always wanted. Before the remodel the main living areas in the home felt cramped and dated. 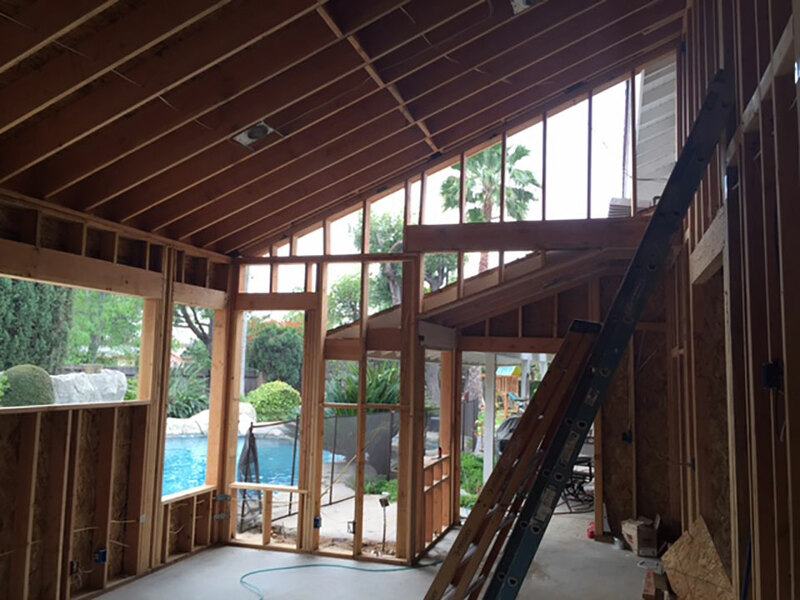 The ceilings were relatively low, and wood beams made it feel even more enclosed. 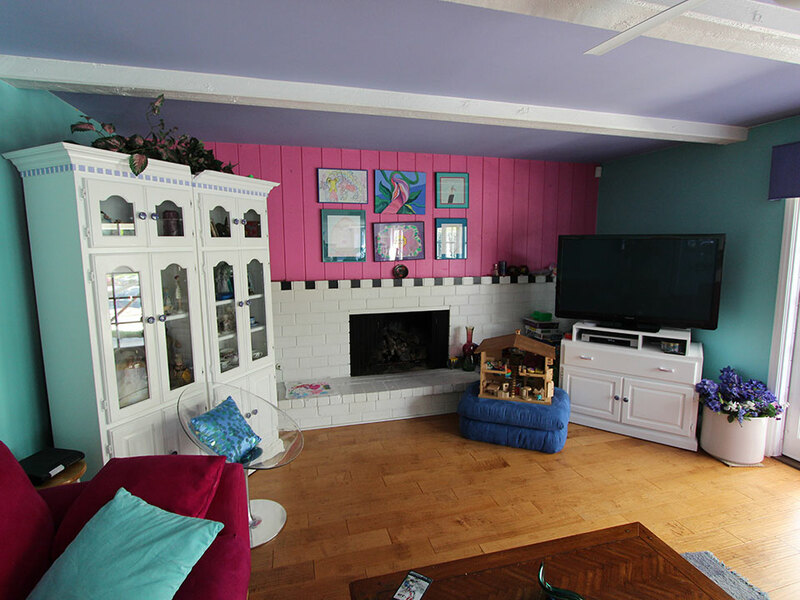 The family room included a wide, white brick fireplace that lacked a mantle and was topped by plank panels. 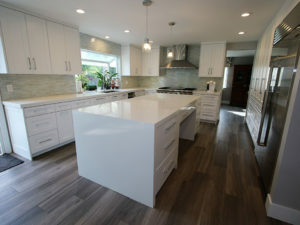 The kitchen was large with a functional footprint, but the countertops, cabinets and light fixtures were outdated, and there was a shortage of cabinet and storage space. The kitchen island was also relatively small, and the bar hardly extended at all, with no additional leg room if people were seated here. At the front of the house, there was a traditional staircase, which felt heavy because of its wood construction, and the hallway leading from the kitchen seemed narrow and closed off. 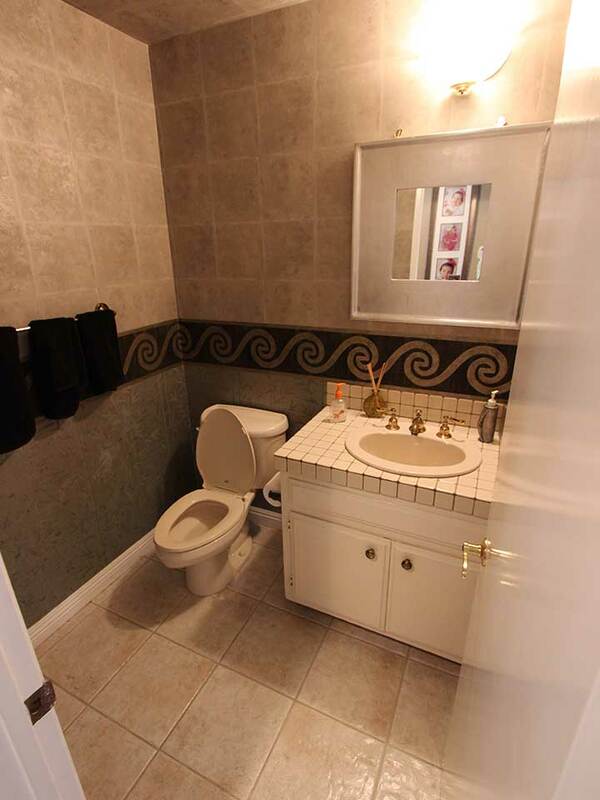 The guest bathroom featured a vanity with a tiled top, as well as dark tiling running along both the walls and the ceiling, making the space feel smaller than it actually is. 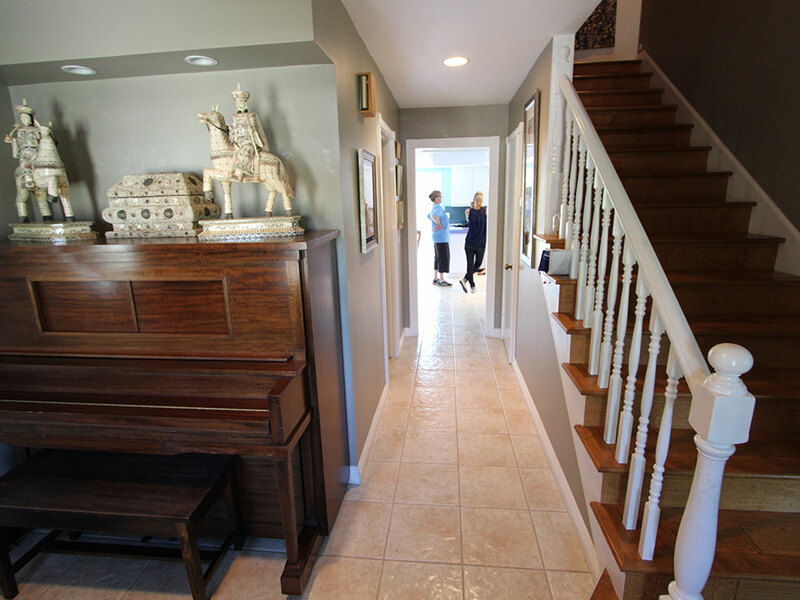 Alex worked with the homeowners to create a remodeled kitchen, living area, guest bathroom and a revamped staircase. While this was a large project, it was the planned master suite addition that represented the bulk of the architectural work. 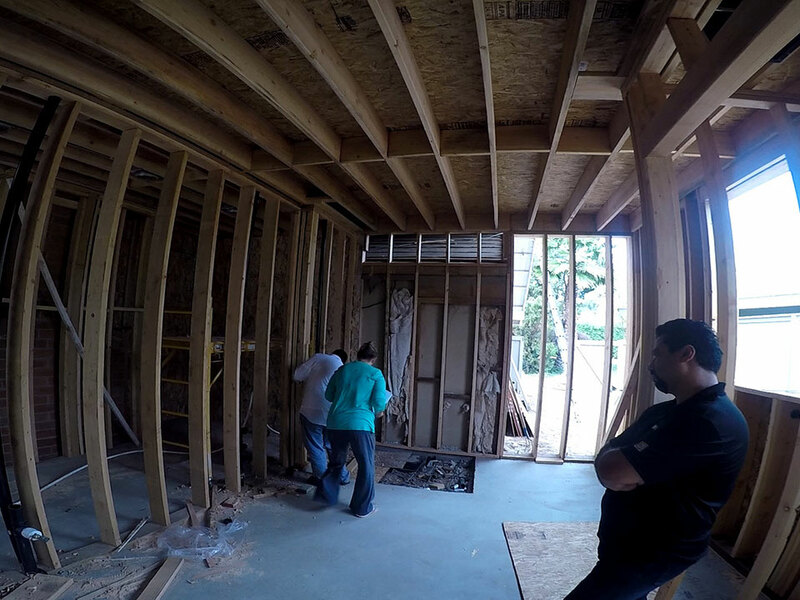 Robin and Tom, along with Alex, planned to add about 600 square feet of additional space through the master suite addition, which would include the creation of a foundation, framing, and roofing. 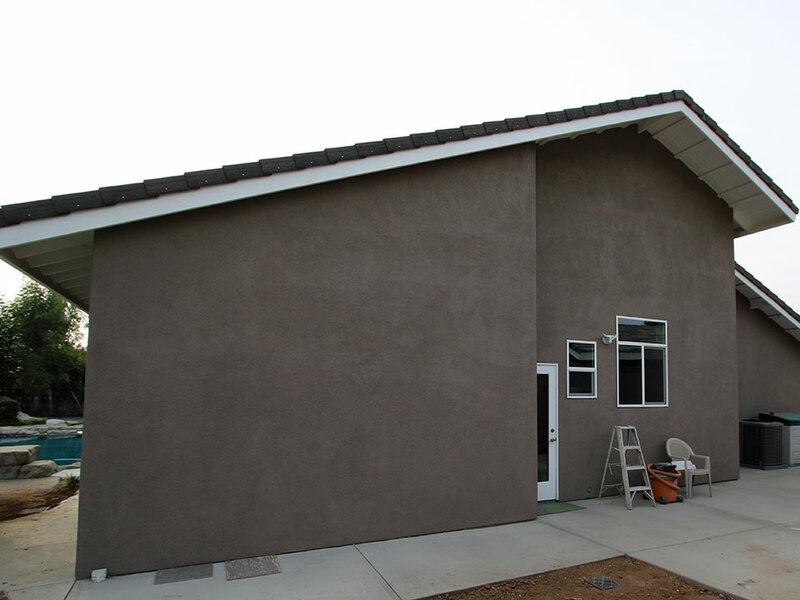 The complexity of the addition required APlus to create not only architectural plans but also structural engineering. The demo process included the removal of cabinetry throughout, the removal of flooring and baseboards throughout the downstairs level of the home, the removal of casings to all interior doors, the removal of an upstairs linen closet, the removal of ceiling drywall in the family room and kitchen, panel removal above the family room fireplace, the removal of the brick and hearth from the fireplace wall in both the living room and the family room and the removal of wainscoting in the dining room. The kitchen retained some of its original footprint and layout, but became an open, modern space with a sleek, clean design. 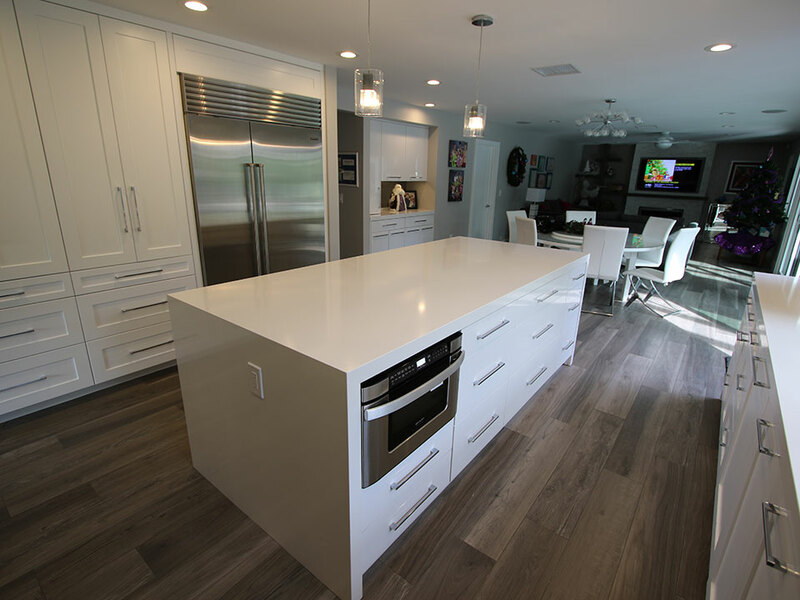 APlus manufactured the custom cabinetry in a European style with a white finish. The maple cabinetry includes high-end chrome pulls and hardware. Built-in features include lazy Susans, spice pulls, and a double trash pull. 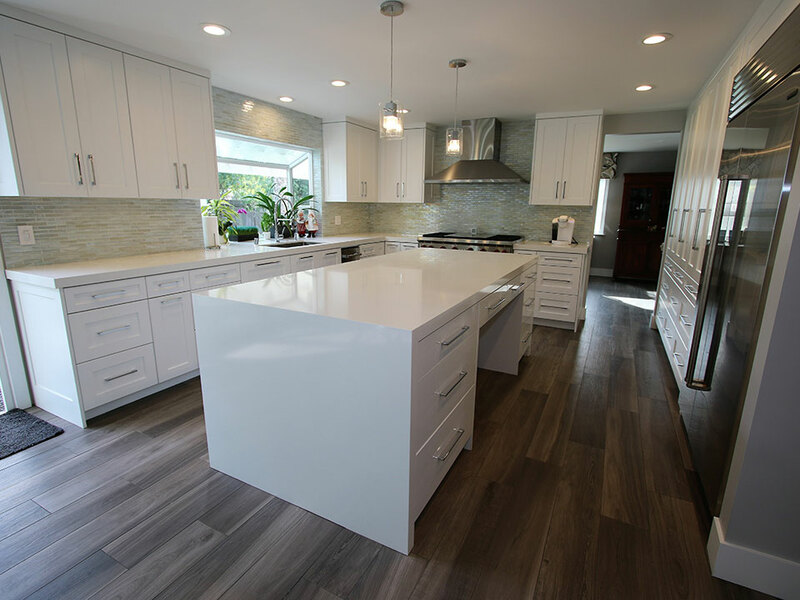 The island features abundant built-in storage and is topped by a white stone countertop with 2.25 mitered edges, cascading to the floor in a waterfall style. 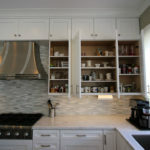 The customized built-in pantries feature three bottom drawers, rollouts to eye level and adjustable upper shelving. The high-end appliance package includes a Zephyr Sienna Pro range hood, a Wolf 48-inch dual-fuel range and a 48-inch side-by-side Sub Zero refrigerator. The island boasts a built-in microwave drawer while the beautiful kitchen faucet is a Meridian polished chrome pull-down sprayer. 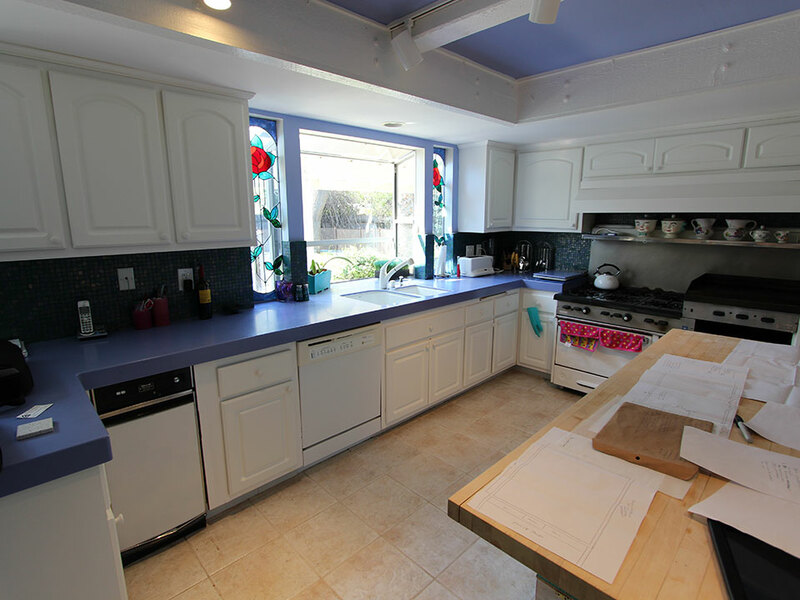 The small bar area of the counter was removed to better open the kitchen to the family room. A glass tile mosaic backsplash was carried to the ceiling, recessed lights were added, and pendant lights hang over the bar. The kitchen opens via a wide door to the outside patio and pool area, and between the kitchen and living area there is space for a dining table, as well as more built-in storage in the form of custom cabinetry and a bar-top counter with the same luxe thick, mitered stone edges of the rest of the kitchen. Over the dining area hangs a sculpturally-inspired modern light fixture with straight lines and glass globes. The sightlines between the kitchen and family room are completely open, which makes it feel much larger and more functional than the previous design. 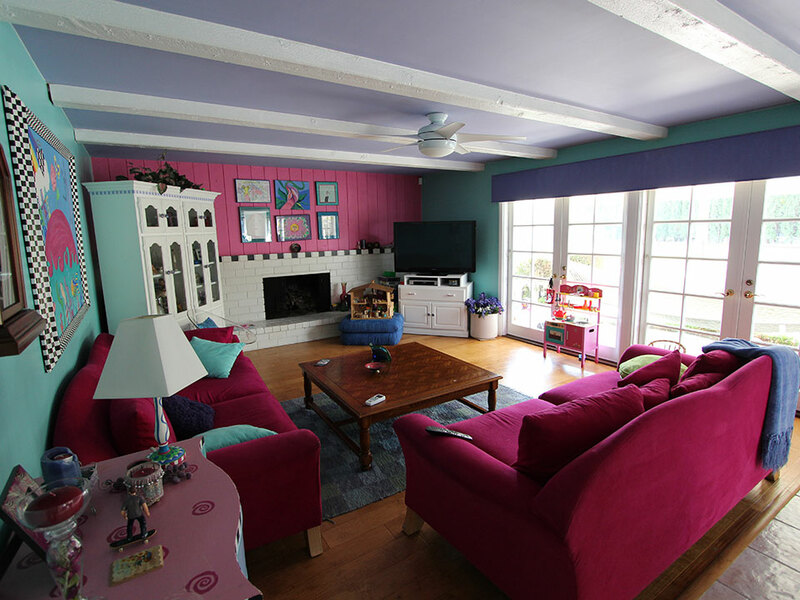 The living area was transformed from cramped and dated to bright, open and modern. The main focal point of the room is the fireplace, which was redesigned to include a stacked stone surround, along with a custom mantle that extends to built-in shelving installed along the wall. The fireplace design includes a recessed TV niche, and the richly colored plank flooring from the kitchen continues here. 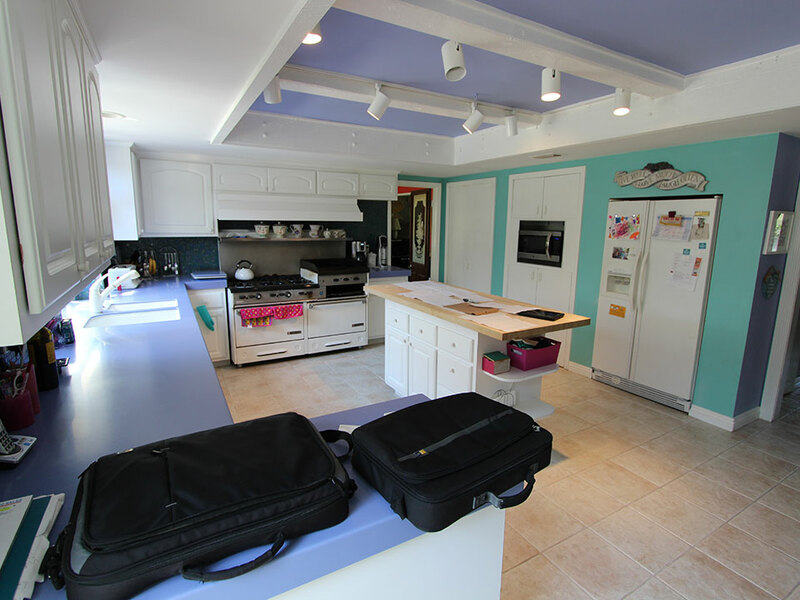 The heavy ceiling beams were removed and recessed lighting maintains the feeling of a high, airy ceiling, much like the kitchen. 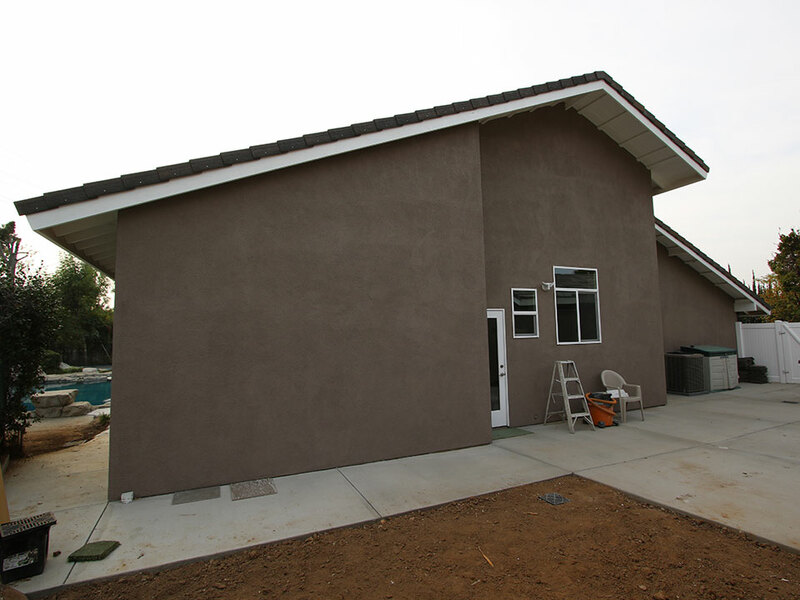 The main floor master addition was a crucial component of the redesign. 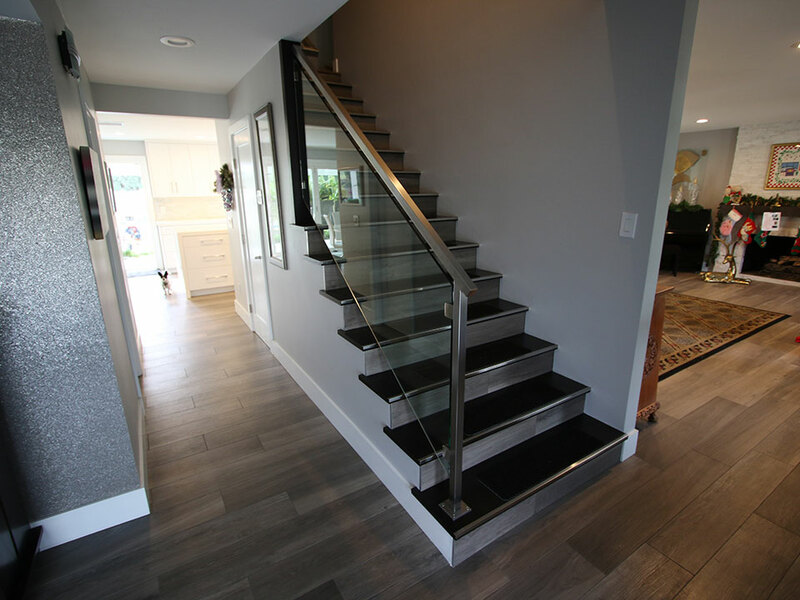 The homeowners wanted a master bedroom and bathroom that would offer them space, functionality and a sophisticated design that was in-line with the remodel happening elsewhere in their home. 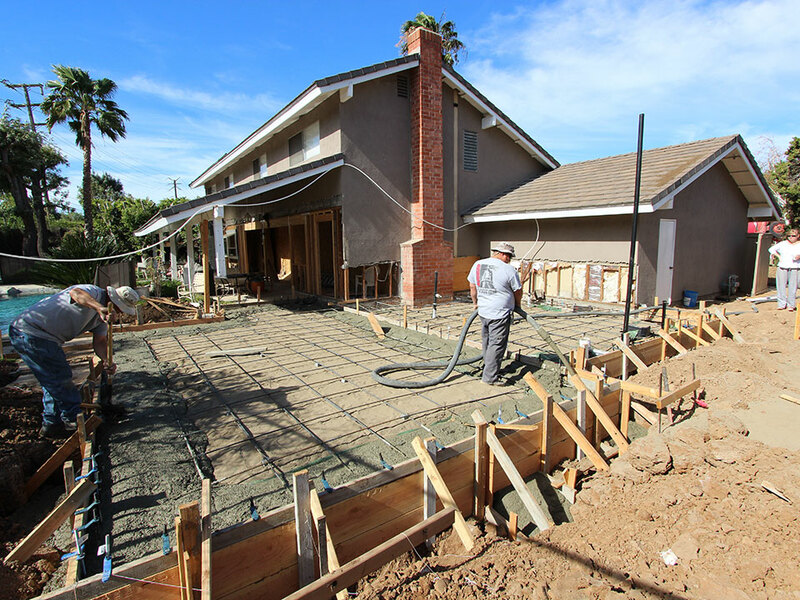 The addition and exterior work completed by APlus required the pouring of new footings and slabs before framing began. The master bedroom includes ample natural light as well as incredibly high vaulted ceilings. There is a separate outdoor entry and exit space that includes French doors delivering views of the existing pool area. One entire wall of the bedroom is made up of closets constructed of wood grain melamine with a customized APlus organization system. In the master bathroom, white European-style cabinetry was used, and the expansive double vanity is topped with gray quartz. Adjacent to the vanity is a spacious walk-in frameless shower with a built-in seat area and large-scale Eleganaza tile from the Loft series, in Grigio. More storage is included with the addition of custom free-standing linen closets that match the design of the bathroom’s primary cabinetry. A built-in vanity features seating space, and a walk-in bathtub is set under a large low-E window. 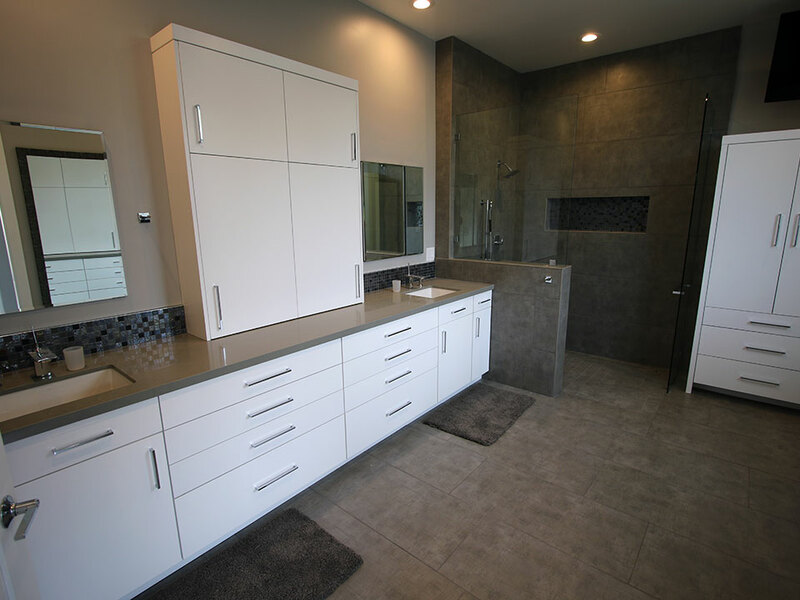 Another area of the project included a refresh of the powder room to include a sleek, floating vanity with high-gloss Euro cabinetry in “Storm.” The dark color of the vanity juxtaposes the white, thick-cut countertop and additional storage was added diagonally from the toilet and vanity. 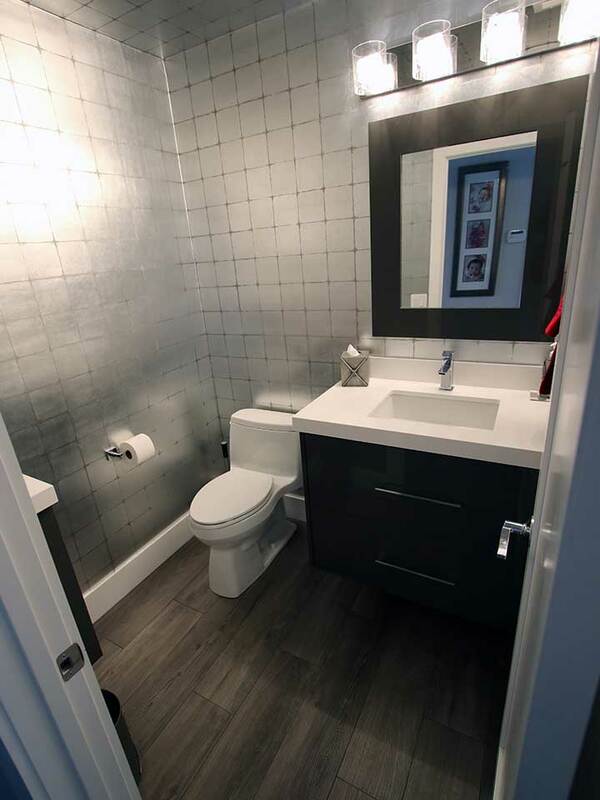 A decadent metallic wallpaper was added, while the plank flooring found throughout the rest of the house is also included in the new powder room design. The quartz countertop is carried upward to create a vanity backsplash. 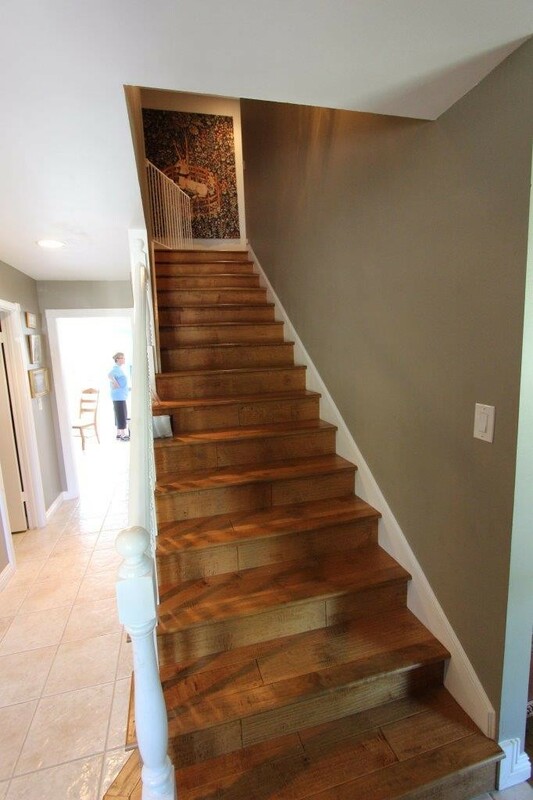 Also included in the main level remodel of this Villa Park home was a refreshed staircase. 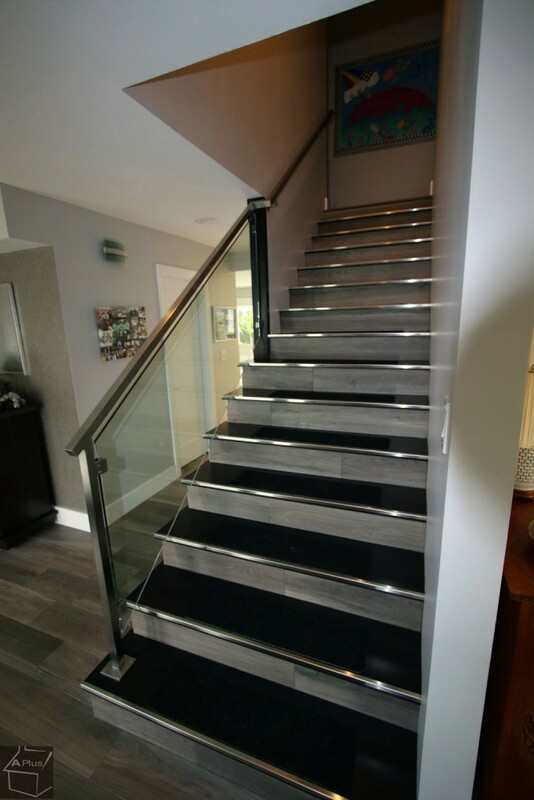 In place of heavy, dark wood steps there are now black stairs with tile risers and a glass and steel railing floats alongside the stairs, which makes them feel more open than they were previously. The formal living area includes a style similar to the living room adjacent to the kitchen, featuring the continuation of wide plank-style flooring with detailed graining. The living area to the front of the home also includes another stacked stone fireplace, as well as recessed lighting. The laundry room underwent changes as part of the remodel to include custom European maple cabinetry from APlus with 3-inch shaker doors. 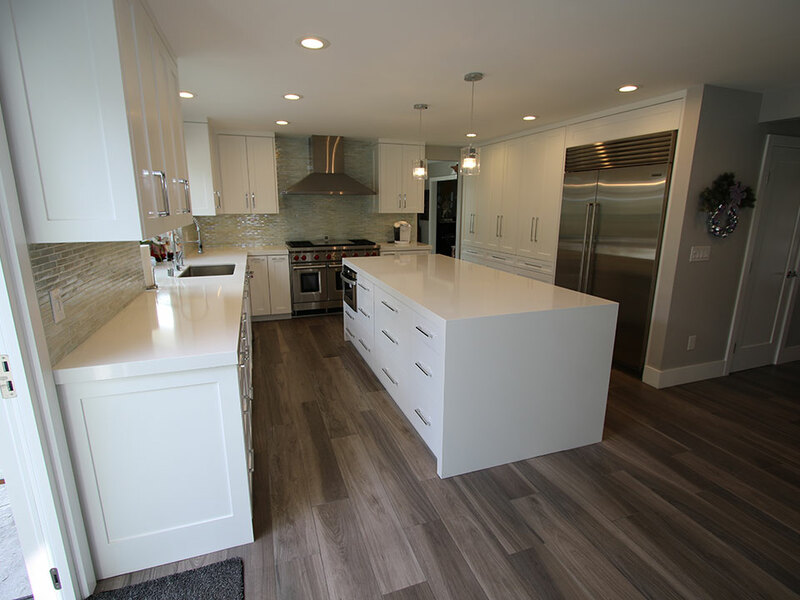 During this intensive construction and remodel project APlus and Alex’s team were careful to not just produce an outstanding design that exceeded the owners’ expectations, but they also worked to make the process as seamless and comfortable as possible for them.